You’d really have to be hiding under a rock not to know that Sesame Street has hit the big 4-0. The media blitz has been quite impressive, with the Muppets taking over game shows, talk shows (did you see them on The Doctors? ), even being honored with their own Google logo. Naturally this required the release of a 2-DVD set Sesame Street: 40 Years of Sunny Days . Heck, JavaDad turned 40 in the same year and even he had a DVD — albeit made by his brother. When the PR folks behind the blitz asked if I’d like to review the DVD set, it took me half a second to give a resounding YES, and I apologize that it has taken me this long to write to tell you about it, because it is terrific. In fact, it is going to become my favorite gift to give in 2010 for children and adults alike. Let me back up a little bit — it just so happens that the set arrived late in the day after a very bad day. I was in a terrible mood and really did not want to interact with anyone, including my family. I waited until the kids were in bed and sat down to watch the first DVD. Not long into it, my mood started to brighten and I actually called JavaDad over to watch the DVD with me, and we soon found ourselves laughing over favorite segments and saying things like, “Oh my gosh, I absolutely REMEMBER this. I mean I remember everything about this. It’s like I am a little kid again.” It wasn’t the same experience as watching a rerun of a Law & Order episode where you can recite some familiar lines — it was an almost indescribable full sensory recall for both of us, over and over again with several of the segments. For example, for me, I completely remember the stop-action animation of the Queen of Six, which I know I have not seen in decades. Watching these segments reminded us of the positive feelings Sesame Street made us feel, as well as how much we actually learned while watching the show (do you remember who taught you the word “cooperation?”) We may not have realized it as children, but now as parents, we recognize just how important Sesame Street was to us. It was more than a show, it was a parenting tool. My husband and I dissected the show and realized that it did so many things — yes, it helped us learn our ABCs and 1, 2, 3s. It also made us feel special, and fostered a sense of kindness and respect for others. However, I realized in a very short clip that showed a steel extrusion factory, that it opened up a world for so many children — I learned about so many different places via Sesame Street and while I grew up in multi-cultural Miami and had the benefit of many field trips, not all children do. For some children, their only opportunities in the early 70’s to learn about something other than the businesses and people immediately out their front door may have only been through the camera lens of Sesame Street. Today children have so many choices of shows, some of them are of terrific quality and are descendants of sorts of Sesame Street, and of course there are many shows that are merely bubblegum for the brain. But when our generation was growing up, Sesame Street was groundbreaking, and of course we didn’t have cable, so there were far fewer shows to choose from. I found the comments from Jon Stone, Executive Producer (1969-1975), Director (1969-1994) of Sesame Street (you can find these interviews as part of the Bonus features) both humorous and insightful as to to just how unique Sesame Street was at its inception. “When we first began and they told us we had to incorporate all this education into this format I was convinced that it would be impossible to do. I’d never written anything like this before, but nobody had written anything like this before. But we tried it anyway… And I almost immediately did a 180 degree turn in my attitude about it. The educational content, the curriculum, instead of being a millstone around our neck was really a backbone, a spinal column that we could build the show around. No longer as a comedy writer were you starting with that terrible blank piece of paper in the typewriter, you were staring out with something that you could build a comedy bit around and it was a tremendous help. I’ll never again do another television show that doesn’t have some informational content in it. Because I’m lazy!” said Stone. Today many television producers don’t find the concept of educational shows so odd, they see it as the next potential goldmine. Of course the clips progress beyond the years JavaDad and I watched Sesame Street and it’s interesting to watch the changes of styles and characters (and to read about the reasons for changes in some of the pop-ups and also in the accompanying small book) right up to modern day, which is the Sesame Street my child watch. My kids, however, have been fascinated with the concept of the “Sesame Street from when you were a little girl, Mommy” and like to watch those clips over and over again. The Sesame Street: 40 Years of Sunny Days set includes more than 4.5 hours of clips from all 40 years as well as pop-ups and interviews and a 24-page hardcover book. You may not want to let the kids see the book if you don’t want them to see the behind-the-scenes workings of how the Muppets work. My husband and I enjoyed learning things like the fact that Oscar the Grouch was originally orange and about the struggles the producers had in figuring out how to explain the death of Mr. Hooper. I never realized what a singing sensation Bob McGrath was in the US and Japan, nor how popular Roosevelt Franklin was and that he released his own record! I highly recommend this gift not only for children, but also for adults — anyone who grew up with Sesame Street will find something to love about this, but it will also make a great 40th birthday gift. I really think my husband and I enjoyed this DVD as much if not more than our kids because we could appreciate the full retrospective context. 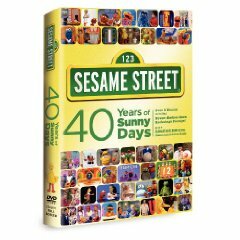 Sesame Street: 40 Years of Sunny Days seems to be available at most major stores that sell DVDs and lists anywhere from 29.99 to 19.99. Bonus for my readers: Here’s a downloadable Sesame Street coloring page! Disclosure: I was provided a complimentary DVD set to review, this did not affect the outcome of my review. This blog is a member of the Amazon Associates program, which means Amazon purchases made immediately after visiting this site may give a small percentage of the sale to this site. This helps offset the cost of running this blog. I watched those opening segments with my child who was born in 1969 and found they helped connect us. Just this past week I had an occasion to watch the current form of Sesame Street with my grandchild and marveled at how fresh it seemed. I would love to have this DVD as a remembrance of those days 40 years ago and to learn about the evolution of the show. I might even share it with my grandkids! !